Bed linens from Williams Sonoma Home top the bed in a New York apartment designed by HGTV designer Vern Yip. The residence is part of the grand prize offered in HGTV's Urban Oasis Giveaway. Along with all the other new building that’s going on in my neighborhood in Lower Manhattan, I’ve been watching the construction of the new W Hotel and Residences. Designed by the New York architecture firm Gwathmey Siegel, the building is due to be completed soon, and one of the residences in the swank new high-rise is being given away with the launch of the HGTV Urban Oasis Giveaway, the latest of HGTV’s popular annual Dream Home and Green Home giveaway events. Last week, I was given a personal tour of the 900-square-foot apartment by designer and host of HGTV’s Design Star Vern Yip, who created the interiors. Valued at more than $1 million, including the furnishings and custom finishes, the residence includes one bedroom, a luxurious bath, a gourmet kitchen, and a bright living room with sweeping views of the Lower Manhattan skyline, the Hudson River and the Statue of Liberty. The giveaway package also includes an Acura ZDX. Befitting its context, Vern relied on New York City as the design inspiration for the interiors. “This apartment is like a love letter to New York,” Vern told me, as we walked through the space. “New York is a city of amazing contrasts—not only are there 18th-, 19th-, and 20th-century buildings juxtaposed with structures that were built yesterday, there’s also an amazing mixture of cultures and people from all over the world—and I wanted to bring that diverse spirit into this space.” Playing off a mix of old New York influences and new, Vern merged furnishings and accents from boutique-y New York shops like Las Venus, ABC Carpet and Haus Interior with photographs by local artists. He also worked with house planner Jack Thomasson, who oversaw the construction of this apartment as well as 15 other HGTV Dream Homes and Green Homes, to finish out the residence with custom closets, the custom kitchen cabinets and appliances, walnut hardwood floors and beautiful finishes and fixtures in the bath. You can visit HGTV.com to see the cable network’s blog, exclusive videos of the neighborhood and a virtual tour of the residence, which will be shown online starting tomorrow. Once the entry period for the giveaway begins on September 1, you can enter once a day via HGTV.com as well as once per day on FrontDoor.com. The first on-air tour of the home will be presented on the HGTV Urban Oasis 2010 on Monday September 6, 2010 at 8:00 p.m. ET. The giveaway period runs from September 1-October 20, 2010. 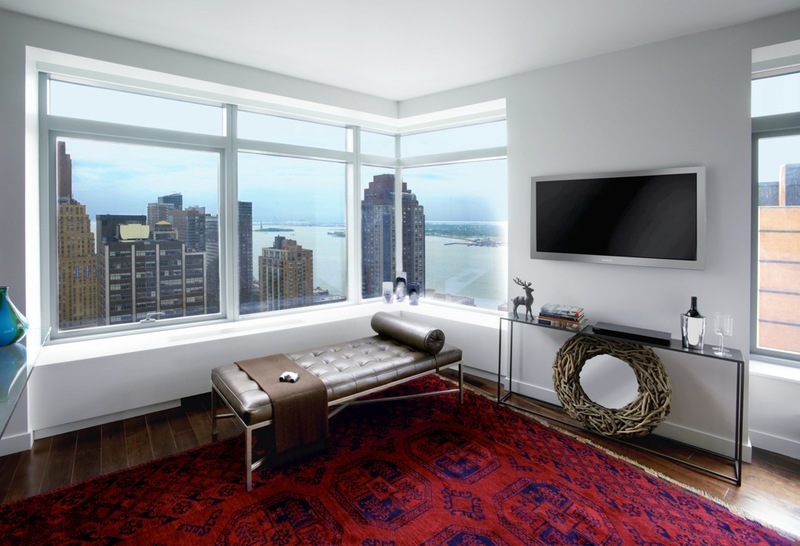 Located in the W Hotel and Residences in Lower Manhattan, the condo overlooks the Hudson River and the Statue of Liberty. I’ve never won anything in my life. This would be fantastic. I’ll cross my fingers and toes. This sounds absolutely wonderful and the view must be breathtaking. Can wait to see who wins. Hopefully it’ll be me. Wow–this is amazing! I hope I win!